I adore cooking lettuce. Sometimes, I like to wilt it with chicken stock and plenty of black pepper, parsley and lovage. Sometimes, I fry wedges of small lettuce in butter and olive oil, with salty anchovies and lots of garlic, until its sugars caramelize, then I serve it with heaps of grated Parmesan cheese. And soup, I make soup a lot with lettuce. But, with their close, tight leaves, little gem lettuces are also perfect for cooking on the barbecue or chargrilling. You want to get the embers good and hot, to give some real colour to the cut face of the lettuce. 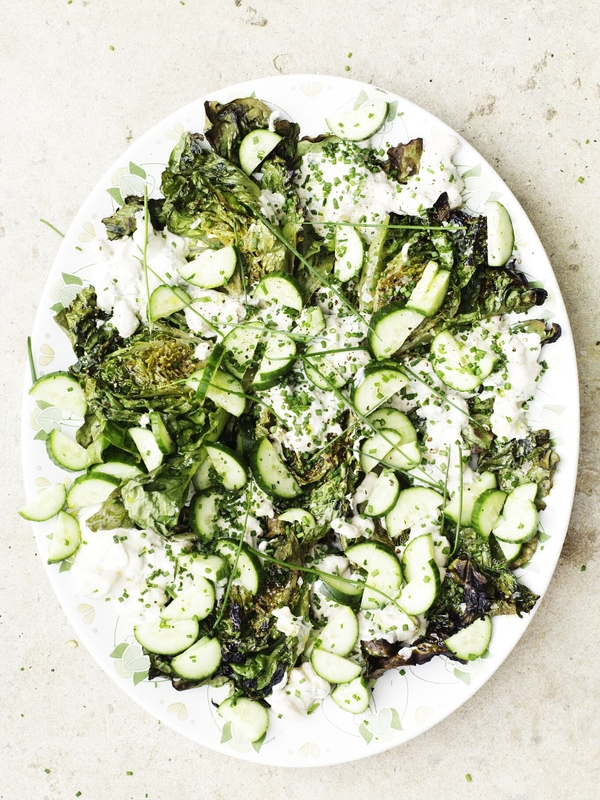 The contrast in this warm salad comes from the fresh, cool crunch of cucumber. It’s all brought together with a beautiful, sort-of dressing, made from white beans, yoghurt and tahini. Heat 1 tablespoon of the olive oil in a medium frying pan over a medium–high heat, then add the garlic. Fry for 25–30 seconds, until the garlic begins to soften, then add the white beans and lemon zest. Stir to combine and cook for 1–2 minutes more, until the white beans are warmed through. Now, stir in the tahini, yoghurt, lemon juice and parsley, along with 2–3 tablespoons of water. Cook for a further 1–2 minutes, until spoonable. If it’s too thick, add a little more water. Remove the pan from the heat. Light your barbecue. Season the little gem halves with salt and pepper, and drizzle them with 1 tablespoon of the oil. When your barbecue coals are glowing nice and hot, lay your little gem lettuce, cut-sides down, onto the grill. Grill the lettuce for 5–10 minutes on each side – how long will depend upon the heat of your coals, but aim for the lettuce halves to soften, take on some colour, and caramelize; a little charring improves the dish. (Alternatively, cook on a preheated chargrill pan.) When the lettuce halves are ready, place them on a large serving platter cut-side up. Put the bean and tahini dressing back on the heat to warm through, and give it a final stir. Spoon it over the lettuce, making sure it trickles through and around the layers of leaves. Scatter over the prepared cucumber, sprinkle with the chopped chives, strew over the long chives, then drizzle over the remaining olive oil and season everything with salt and pepper. Serve the salad straight away.